Heard about Lysaght Mini Orb fences? Colorbond steel fences have become a common feature on properties in Western Australia because they durable, timeless and easy to maintain. They work well in almost any setting. But, there’s also another way to get the durability and easy maintenance that Colorbond has come to be known for, and it’s a fencing option that delivers an enhanced visual quality. We’re talking about Lysaght’s Mini Orb profile. The corrugated Mini Orb profile (as used in galvanised Mini Orb fencing) makes it possible to utilise Colorbond steel panels in a different way for a more striking, eye-catching design. For home and business owners concerned about aesthetics, this is a noticeable change because there is a contrasting surface that serves as a visually appealing accent feature. Overall, this accentuating feature makes for a more interesting security and privacy fence to complement your landscaping and décor and improve the general appearance of your property. Looking for a long-lasting, low-maintenance fence that will turn heads? Mini Orb fencing is an excellent option that is secure and private. In general, you cannot go wrong with Colorbond. For fast, professional installations of Lysaght Mini Orb fences in Perth or Bunbury, Contact Team Work Fencing. 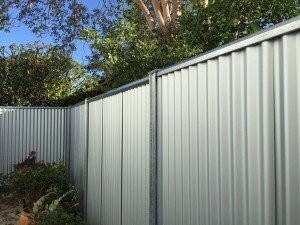 Our contractors are Colorbond fencing experts, and we provide free quotes!